Push your creative practice and research beyond its limits, or take a bespoke training course to develop your skill set using our affordable, kitted-out facilities. 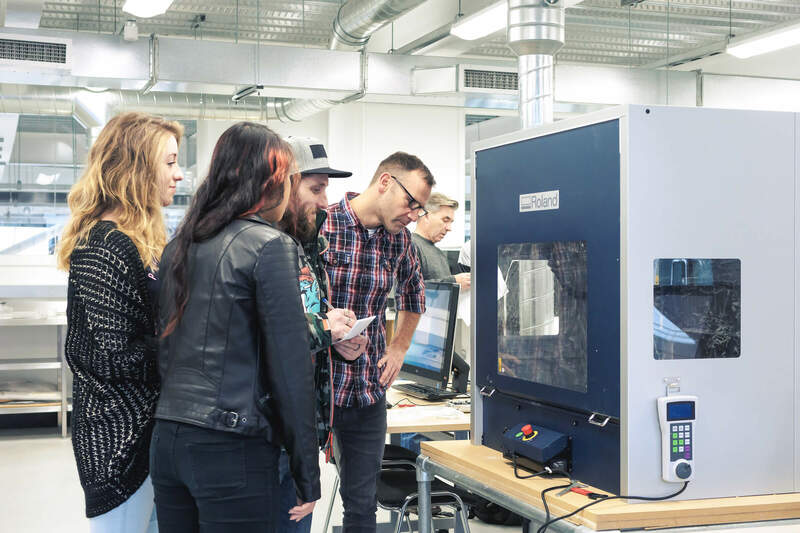 Fab Lab Plymouth gives students, schools and educators the opportunity to explore digital technologies, offering a huge range of equipment, processes and expertise at minimal cost. Teachers, let us work with you to ignite the curiosity of your pupils. Currently studying? Turn your drawings and ideas into real-world artworks with our 3D printers. Want to capture an object to feed into some research? Stop by our lab and scan it with us. Thinking about combining laser cutting and traditional printing? We’ve got that covered too. The Fab Lab is open to all students, across all disciplines, regardless of where you are studying. We welcome school groups as well as individual students of all abilities and ages, and can run workshops, help with projects, or simply help you learn how to use our industry-standard equipment. Plymouth College of Art students can access the Fab Lab via taught sessions and through individual bookings. This facility and support is offered free of charge to Plymouth College of Art students, but the cost of materials will be charged on a project-by-project basis. Students and school groups from other institutions will just pay our normal discounted student rates. Please contact our team at fablab@pca.ac.uk. for more information. Plymouth College of Art students only - please click the link below to book a consultation with a Fab Lab Technician using the Connect 2 system. Experiment with rapid prototyping, trial concepts, create one off designs and manufacture small run batch productions. Upskill your team with Fab Lab Plymouth with a bespoke short course — we’re here to help grow your business. Got a DIY hack you want to test? Are you a designer-maker looking to develop your ideas? The Fab Lab Plymouth team are on hand to help make it happen.